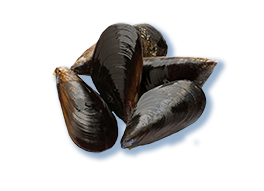 The Mediterranean mussel is a bivalve mollusc that can grow to a maximum length of 11 cm but the average market size is 6 cm. It is found in the Mediterranean where it lives in large communities on rocky substrates it attaches to using the byssus silk (a keratin filament) which reforms several times throughout its life. The shell is black or purple-black externally and features concentric and radial circles produced by growth; inside, it is smooth with mother-of-pearl colouring. The two valves are held together by a hinge mechanism. The Mediterranean mussel is a filtering organism that feeds on plankton and suspended organic particles. It is a favoured seafood. In some particularly suitable areas, wild mussels are caught but, more often, it is farmed in nurseries throughout the Mediterranean – more than 1400 staff are employed in mussel farming in Italy alone, and production is higher than 50,000 tonnes/year with more than 240 installations currently active in the whole of Italy.